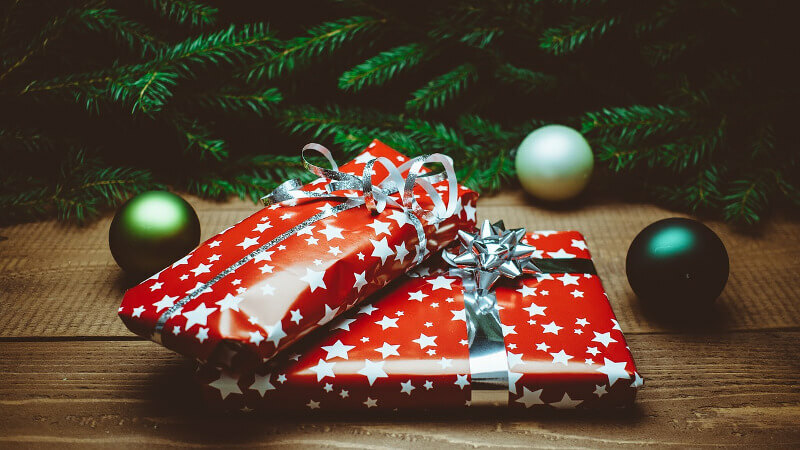 If you’re looking for something special for an Orthodox Christian child, you’ll find it on this list. The list includes books, of course. Because books. But don’t miss the other gift ideas! Most of them are hand-made. They’re beautiful, meaningful, and the little ones in your life will love them. And if you’re shopping for a not-so-little-one (or even for yourself! ), don’t miss the glass icons and the weighted blankets. Seriously. Those are lovely gifts, no matter how old you are! These handmade Waldorf-style dolls from Cozy House Curios are absolutely amazing and utterly gorgeous. They come in two sizes. The smaller ones, intended for babies and toddlers, come with everything stitched down tight, with no small parts that your little one can remove. The hands and talent behind the dolls, Matushka Anna, lists them in her Cozy House Curios webstore as she makes them. 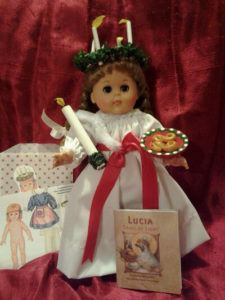 She is willing to make a custom a doll for you that it looks like a particular priest that your child knows and loves. If you want that, message her through the webstore. It might, perhaps, be possible to get one of these wonderful dolls if you order from the webstore by December 16. But they are handmade, one at a time, by one person. So they take time. If you want one for Christmas, particularly if you want it customized, get your order in ASAP. With one of these beautiful crocheted censers from Cozy House Curios, you can add liturgical play to your child’s dress-up corner. Matushka Anna makes the censers in silver and gold, with and without bells (or with detachable bells!). 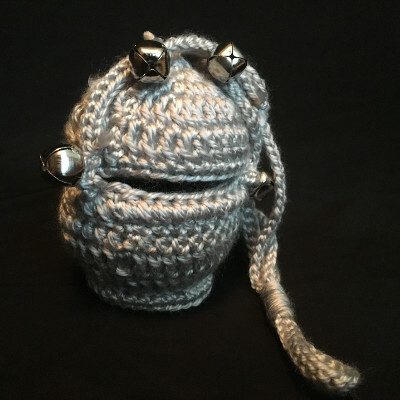 The last day to order a censer from the Cozy House Curios webstore, if you want it for Christmas, is December 16. If you want one made-to-order, you to need to order by December 11. Because these are hand-made, if you want to be sure to get one, you might want to order soon! 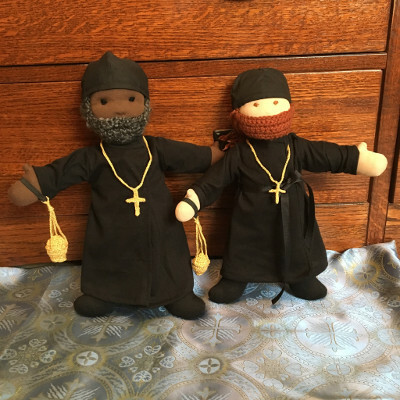 The hand painted peg dolls by Emily Neve of Edmund and Ambrose are amazing. She makes both simple Waldorf-style peg dolls, and detailed icon-style peg dolls. I bought one of each for my St. Nicholas collection as soon as I saw them. 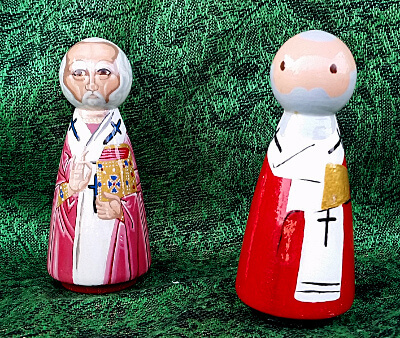 You can now get peg dolls of St. Nicholas (and other saints), from Paidea Classics. Each peg doll comes packaged in a little organza bag with six imported chocolate coins. I love Little Saints blocks and playsets! 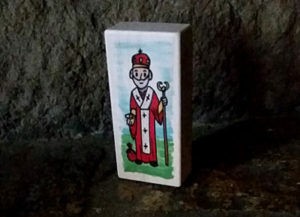 They have a Saint Nicholas block, of course, along with a wide range of other saints, with more being added all the time. And their playsets include additional pieces – like a bear with the St. Seraphim playset, or a cow and a donkey with the Nativity playsets. The 1.5 x 3 inch blocks are just the right size for little hands. They’re made from maple, with images printed directly on the wood. The edges are nicely rounded. 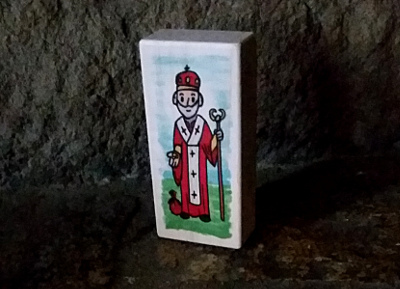 The images are inspired by Orthodox iconography, and there’s a simple prayer to the saint printed on the back of each block. But these blocks are toys to play with, not icons to venerate. You may think it’s just too expensive to commission a real hand-painted icon for a child. Peasants in 19th century Transylvania couldn’t afford icons, either. So they created their own, painting the icons on the back side of a piece of glass. Glass icons created in this tradition have the vividness and immediacy of folk art, while still being icons in the aid of prayer. And they are much less expensive than conventional icons painted on wooden boards. 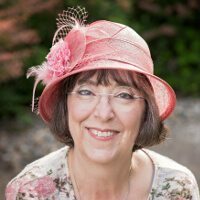 Check out the sizes and prices on iconographer Randi Sider-Rose’s website, Immanuel Icons. If you want to commission a glass icon for Christmas, you must order by Sunday, November 25. Weighted blankets aren’t for the littlest of little ones. But for older children, teens, or adults, they can be life-changing! The gentle pressure of a weighted blanket can make it easier to sleep. They also make people with low proprioception and sensory processing issues more comfortable, reducing baseline anxiety and fidgeting. 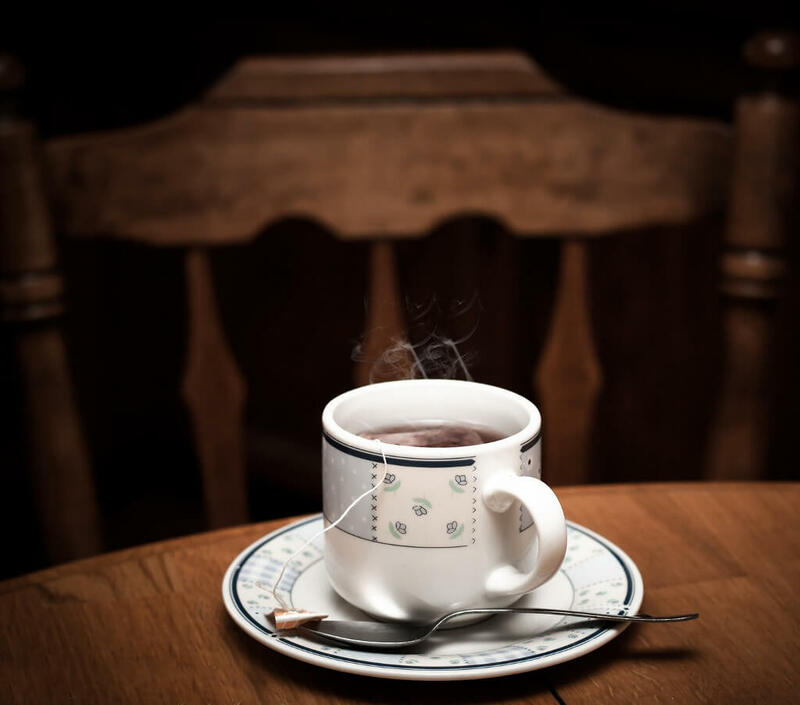 They’re often recommended for people with autism, ADHD, and other neurological differences. My autistic kids (who are in their 20s) absolutely love having weighted blankets. Of course, people who need weighted blankets are often picky about textures of fabric against their skin. 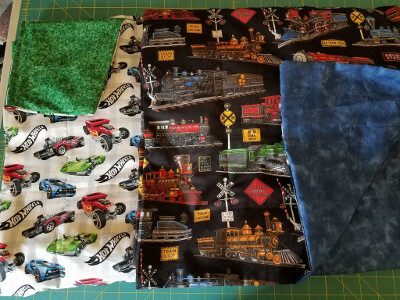 You can get a completely customized weighted blanket in time for Christmas from Applehouse Cottage Quilts. Diane will work with you to get the size, weight, and fabrics that will work best for your child (or for you!). Embroidered Christmas ornaments, made by you! 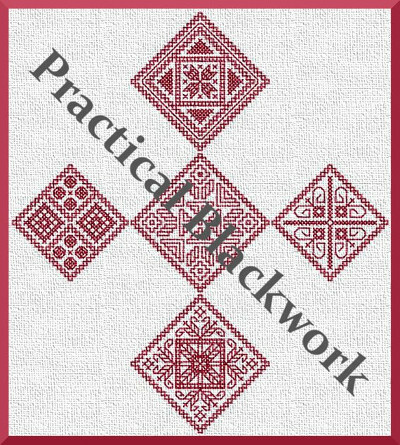 If you check out the Practical Blackwork shop on Etsy, you’ll find two blackwork embroidery patterns for Christmas ornaments, Stars for St. Nicholas and Stars for Elizabeth. 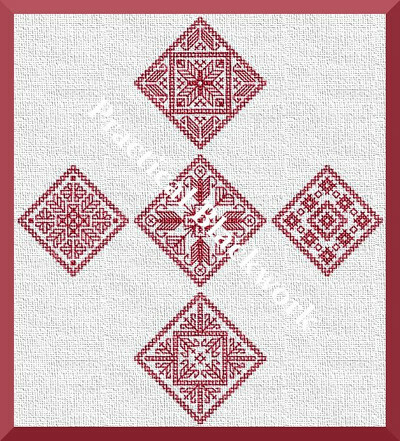 Tracy Thallas creatd the ornament designs for The Saint Nicholas Day Snow. If you work them in red, they’ll match the ornaments on the tree in Catherine’s living room. But you can work them in any color you like. Tracy’s counted blackwork patterns are incredibly easy. 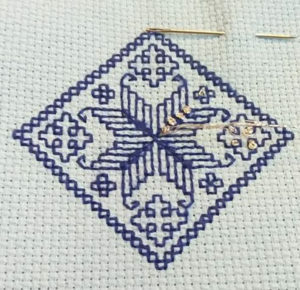 If you can count, and do a backstitch, you can do them. If you’re not sure of your skills, you can try one, absolutely free. It’s called Snow Day Star. Here’s the Snow Day Star in progress, worked with light blue thread with silver highlights. If you love the idea of a Jessie tree during Advent, but you’re bummed out because all of the sets you can find start on December 1, you need the Welcoming the Christ Child book and ornament set. The set combines a book by Elissa Bjeletich with a set of 40 ornaments packed in a tin. For each of the 40 days of Advent, you can read a story from the book, and hang the matching ornament. When my kids were small, I gave them each a holiday picture book every year on St. Nicholas Day. It was a tradition that I treasured. If you do the same, I can recommend The Saint Nicholas Day Snow, or Lucia, Saint of Light, or Sweet Song. The Saint Nicholas Day Snow is not about Saint Nicholas himself (although he appears on every page); it’s about how best friends Catherine and Elizabeth celebrated a particularly snowy St. Nicholas Day, when Elizabeth’s Nana was in the hospital. Lucia, Saint of Light is about a little girl named Lucy celebrating her name day in the traditional Swedish fashion, and learning more about her saint from her mom. 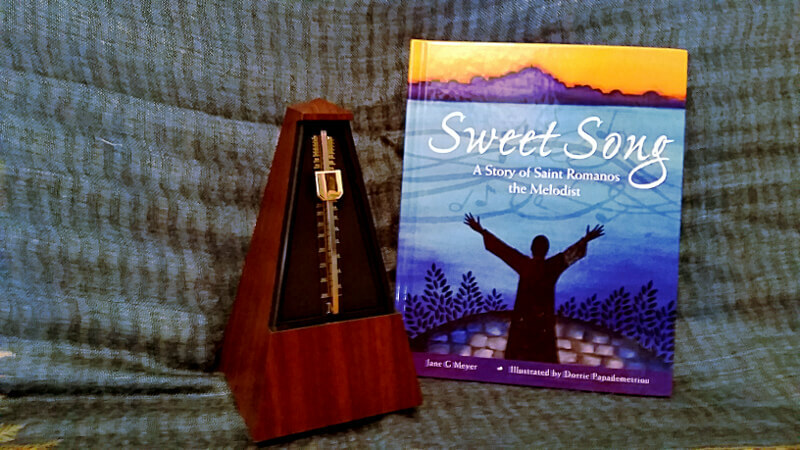 Sweet Song is about Saint Romanos and the kontakion for the Nativity. 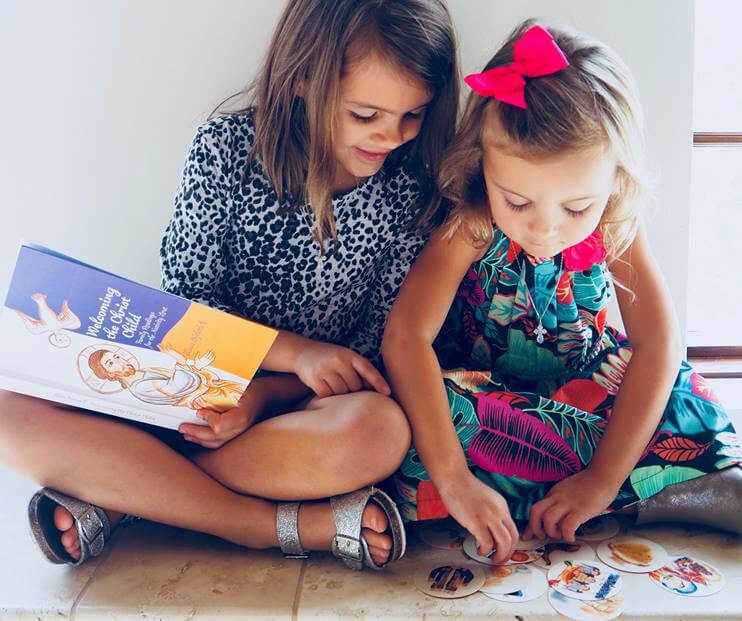 Although they’re not holiday books, the youngest booklovers will love the board books I Pray Today and Goodnight Jesus by Angela Isaacs. They’re not about Saint Nicholas or the Nativity, but they’re wonderful. If none of those are quite right, check out The Saint Nicholas Center lists of books about St. Nicholas! They have a list of St. Nicholas picture books for all ages, and a list of St. Nicholas picture books for older children. 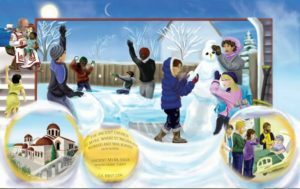 You can also see my list of 17 essential picture books for Orthodox Christian kids. 17 essential picture books for Orthodox Christian kids: These picture books all feature engaging stories with Orthodox Christian characters.